Amit Shah's lunch diplomacy was conducted in a region dominated by the Congress. 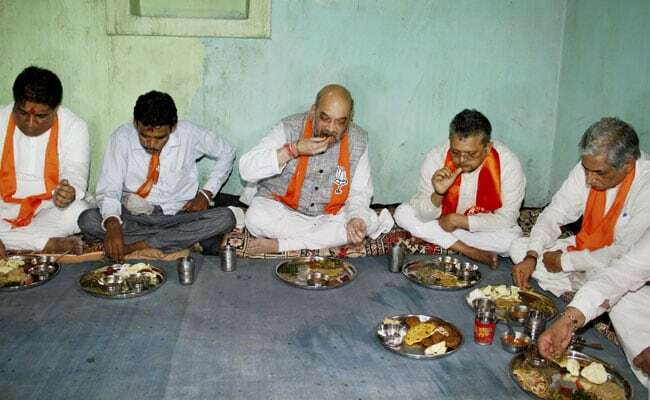 BJP chief Amit Shah had lunch at the home of a resident of Devaliya village in Gujarat. BJP chief Amit Shah turned into a friend with great benefits for a tribal family in the Chhota Udepur district of Gujarat with whom he lunched yesterday. About a month before the politician's arrival, a cooler, an LPG stove, a wash basin and a toilet were installed at the small home owned by Popat-bhai Rathwa, who is a tribal and member of the BJP. Mr Shah, who is a member of the Gujarat assembly, is touring his home state ahead of elections that must be held before december. 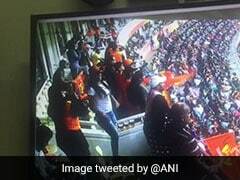 The BJP has governed Gujarat uninterrupted for almost 20 years, and the BJP chief has declared Mission 150 for his party, meaning that its target is to win 150 of the 182 assembly seats, which would mean improving on its current standing. Though the remodelling of Popat-Bhai's home coincided with the arrival of the BJP boss and his entourage, the improvements will remain, stressed BJP officials. This is in contrast to Uttar Pradesh, where an AC was brought in for a visit in March by Chief Minister Yogi Adityanath to the family of a soldier killed by Pakistani troops in Kashmir, and removed after, causing outrage. Popat-Bhai also claimed that the renovation was not the result of a VVIP visit. "We got the toilet made about a month back from government grant. And we got the gas connection under the BPL (below poverty line) category," he said. Amit Shah's lunch diplomacy was conducted in a region dominated by the Congress. The 15 per cent tribal vote in Gujarat can affect the result of 27 constituencies. "While Gujarat remains a strong fortress for the BJP, there was a need to further strengthen its presence," said Mr Shah's party workers. Last month, Mr Shah, 52, lunched with a Dalit couple in a hut in a north Bengal village in Naxalbari. Sitting on the floor, he ate off a banana leaf and the meal delivered the perfect photo op. However, days later, the couple joined Chief Minister Mamata Banerjee's party, leading to allegations of a coerced induction by her team, which was denied.